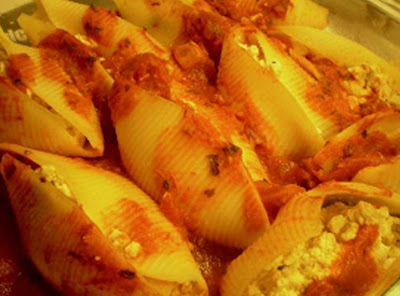 Beth's Super Awesome Blog: BEST Vegan Shells & Cheese! Man, I've been all about food lately, haven't I? Ah, well - I do love food, that ain't no secret! After I finished reading The Kind Diet by Alicia Silverstone, I was inspired to try out a few of her recipes - one of which I made for Father's Day. It was her version of Vegan Shells & Cheese, and it was a HUGE hit. Honestly I didn't miss the cheese at all! You must give this baby a try - I enjoyed it immensely, as did the rest of my family. Every one of us went back for seconds! Boil the shell pasta according to package directions. Mash up the tofu with a fork until it resembles a firm ricotta cheese texture. Add nutritional yeast, basil, garlic powder, salt, pepper, fake cheese (if you're using it) and lemon juice. In a casserole dish, spread out some tomato sauce. Fill the shells with a couple spoon-fulls of the tofu filling. Top with the remaining tomato sauce, and bake for 15-20 minutes. How can something so simple be so easy AND delicious?? I have no idea. I'm gonna be making this meal a lot, that's for darn sure!